Sawyer's New TriBlend Charcoal Hoodie is lightweight, soft and comfortable. 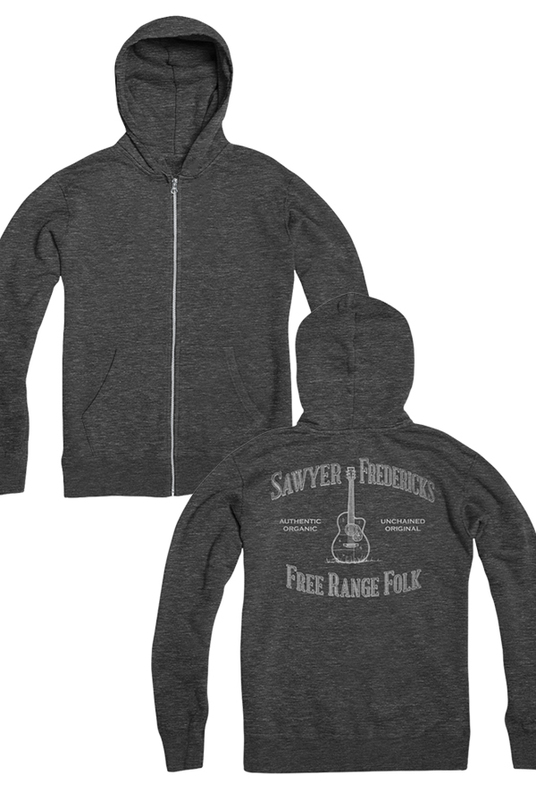 The back of the Hoodie bears a newly crafted version of Sawyer's iconic Free Range Folk Design silkscreened in light gray ink. 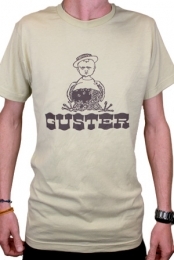 The New Free Range Folk Design includes the words; "Authentic, Organic, Unchained, Original". Sawyer's New Free Range Folk Charcoal TriBlend Hoodie is perfect for year round use. The Hoodie is a soft Heathered Charcoal, light enough for summer evenings, perfect to layer over a thermal in fall or under a coat in winter. Made in the USA from ECO TRIBLEND combed ring spun tri blend 50 % RECYCLED RPET polyester 37% ORGANIC cotton 13% rayon 4.5 oz/sq yd. Sawyer's New Free Range Folk Design Charcoal Hoodie is a single layer jersey, with ribbed sleeve cuffs and bottom band, metal zipper, a kangaroo front pocket and no drawstrings.